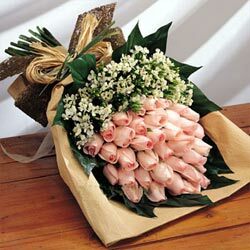 -- send 19 Pink Roses And Baby Breath to china anywhere. We can send 19 Pink Roses And Baby Breath in Beijing , Shanghai , Guangzhou , Shenzhen , Chongqing , Shenyang , Dalian , Qingdao , Suzhou , Dongguan , Fuzhou , Nanchang , Harbin , Nanjing , Huangzhou , Xiamen , Chengdu , Changsha , Zhengzhou , Xi'an , Changchun... etc. We support same day delivery in most place if you order it before 4:00PM.In non-holiday you can order the delivery time. We can deliver to the recipient as quickly as in three - six hours. Delivery time: 8:00am to 7:00pm every day. Please order it before 4:00PM if you want to deliver it between 8:00am to 11:00am next day .